Monument to the 19th Massachusetts on Hancock Avenue near the Copse of Trees, dedicated in 1885. 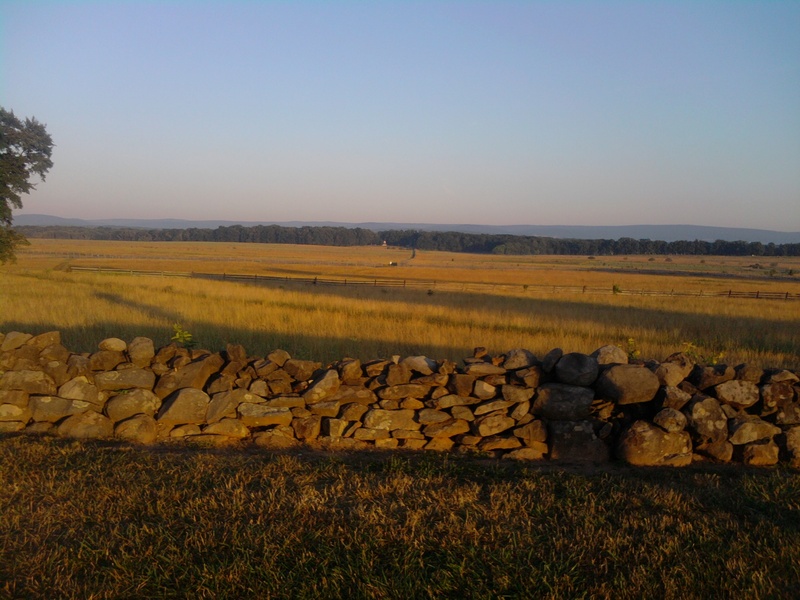 Today, on the anniversary of the third and final day of the Battle of Gettysburg, it seems appropriate to discuss one of the Massachusetts units that was in the thick of the repulse of Pickett’s Charge. During the Battle of Gettysburg, the 19th Massachusetts Infantry was part of 3rd Brigade (Hall), 2nd Division (Gibbon) of the II Corps (Hancock). The 19th Massachusetts began to form in late July 1861 and trained at Camp Schouler in Lynnfield. The unit was most made up of Essex County men–Salem, Gloucester, Newbury and other North Shore towns. They departed Boston on August 28, 1861 and were assigned to General Charles Stone’s Corps of Observation and served picket duty along the Potomac. In March 1862, the regiment was pulled from Harpers Ferry and shipped to Fortress Monroe to become part of the Army of the Potomac and General McClellan’s Peninsular Campaign. They were involved in the Seven Days battles, particularly the Battle of Glendale on June 30 during which the unit took serious casualties. At Antietam on September 17, 1862 the unit was part of the somewhat infamous attack of Sedgwick’s division. Inexplicably led into battle in a closed column of brigades, Sedgwick’s 5,400 men had little room to maneuver and the dense formation was almost entirely surrounded by Confederates in the West Woods. As the division eventually broke and retreated, the 19th Massachusetts remained as one of the last of Sedgwick’s regiments to stand their ground. At Fredericksburg they were again hotly engaged. At the start of the Gettysburg Campaign, the 19th Massachusetts was commanded by Col. Arthur Forrester Devereux. The 25 year old colonel was one of the more colorful regimental commanders from Massachusetts. Born in Salem, Harvard educated, Devereux attended the U.S. Military Academy at West Point but quit to pursue a business career out west. While in Chicago, he met and became business partners with a young man named Elmer Ellsworth. Although the two were not very successful in business, they were quite successful as members of the Illinois National Guard. Both these young men were acutely interested Zouave drill. French units that fought in North Africa, Zouaves wore elaborate uniforms inspired by Algerian fashion (baggy pantaloons, fezzes, and short jackets with ornate braiding). American Zouave units emphasized precision and showmanship in their drill. While in Chicago, Ellsworth formed a Zouave unit known as the Chicago Cadets and at the start of the Civil War led a Zouave regiment, the 11th New York Infantry. Ellsworth became one of the first Union officers killed shortly after the beginning of the war. Returning to Salem in 1855, Devereux decided to create a Zouave drill team of his own. He was elected captain of the Salem Light Infantry, a state militia unit, in 1859. Devereux quickly transformed the Salem Light Infantry into a Zouave company and they dazzled onlookers with their precision during public demonstrations. When the war broke out, the Salem Light became part of the 8th Massachusetts Militia. They had a relatively uneventful 90 days of service. 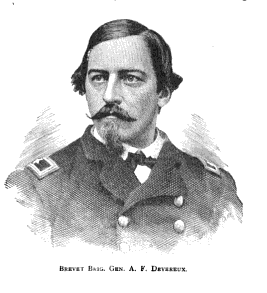 Shortly after he returned home, Devereux became lieutenant colonel of the 19th Massachusetts. It was not a Zouave unit, but Devereux applied himself to making it as well drilled as possible. When the regiment’s original colonel Edward Hincks was gravely wounded at Antietam, Devereux was promoted to take his place. He was an efficient and meticulous commander. The 19th Massachusetts joined the Army of the Potomac’s march northward on June 15, 1863. The regiment numbered 220 men. Two weeks of hard marching followed and though straggling seemed to be universal throughout the army, the 19th Massachusetts was commended by General Gibbon for sticking together and plodding through. On June 29, they marched a wearying 32 miles until they reached Uniontown, Maryland late at night and dropped down to sleep. They remained in Uniontown during June 30. Then orders came to march for Gettysburg at 4 a.m. on July 1. They had 20 miles to go. They reached Gettysburg via the Taneytown Road at 9 p.m. on July 1. 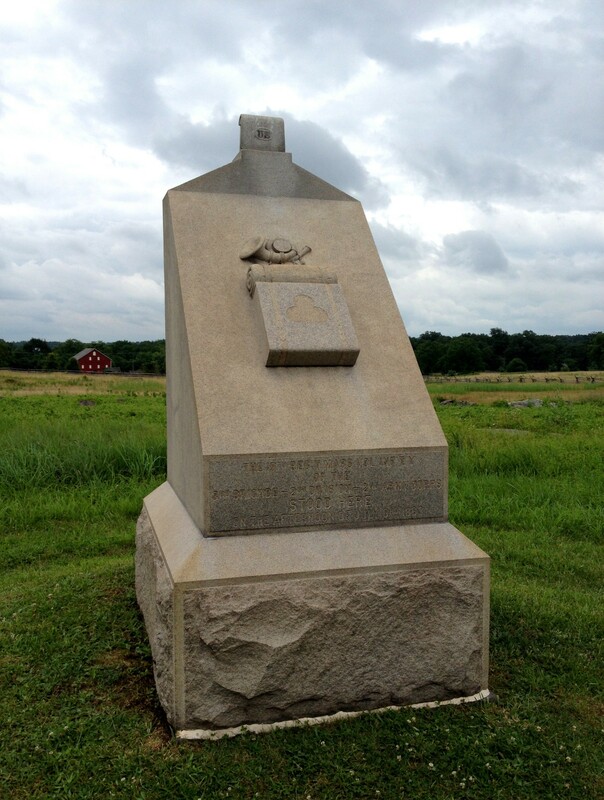 The first day’s fighting had already come to an end and as they neared Gettysburg, they encountered groups of men from the XI Corps who had been badly beaten that day moving to the rear. There was much speculation among the 19th Massachusetts as to how bad the state of things might be. They went into bivouac off the Taneytown Road not far from Cemetery Ridge. On the morning of July 2, their brigade had a quick breakfast, then moved into position on Cemetery Ridge near the Copse of Trees. Most of the day was quiet as the men waited in formation. Lee’s tremendous assault on the Union left flank got underway at 4 p.m., devastating the III Corps in the Peach Orchard and along the Emmitsburg Road. The men of the II Corps on Cemetery Ridge, including the 19th Massachusetts, had a clear view of much of the fighting and grew more and more anxious as they saw the III Corps, their right flank about a quarter of a mile away, crumble to pieces. Gen. Hancock (commanding the II Corps) was ordered by Gen. Meade (commanding the Army of the Potomac) to send several regiments off to the left and front to support the battered III Corps. One of these regiments was the 19th Massachusetts. As Devereux ordered the 19th Massachusetts to double quick by the left flank, he was already considering the futility of the order. The III Corps was already broken. Dozens of Union regiments were streaming to the rear. What possible good would it do to send two regiments to bolster Humphrey’s Division of the III Corps when they were already in retreat? Devereux posed this question to a staff officer, asking exactly what their purpose was given that, in Devereux words, the III Corps “was much broken and fleeing in such confusion.” The staff officer had no answer for him. Devereux picked out a small knoll between Cemetery Ridge and the Emmitsburg Road and decided that was their spot. The senior of the two regimental commanders, Devereux informed Col. James Mallon of the 42nd New York that they would lie here until the retreating units had passed them by. After that, Devereux told Mallon, “Order your men to stand up, fire a volley by the rear and front rank and you will clean out those in front of you and stop them. Then face about, go back to the old line on double-quick, face about again and wait for the Nineteenth.” Devereux was not about to make a suicidal stand against massive numbers. Two shots, one by the rear rank and one by the front rank, thus fulfilling their orders. And then they would get out of that doomed position as quickly as possible. That is exactly what was executed. By the time the 19th Massachusetts and 42nd New York had fired by both ranks, the Confederates were already enveloping their flanks. The two regiments beat to the rear in good order with minimal casualties and reformed in their prior spot on Cemetery Ridge. The Confederate assault had been spent, the gallant men of the 1st Minnesota played a great role in finally putting it to a stop (another story) and the sun soon set on the second day of battle. On the morning of July 3, the men of the 19th Massachusetts sat just to the left and rear of the Copse of Trees. They were the second line–the 20th Massachusetts was directly in front of them. Waiting for whatever attack might come, they improvised shelters from the sun out of blankets and scrounged up what food they could. They did not know that Lee had determined to break the Union center, first with the most massive field artillery barrage of the war and then by hurling roughly 13,000 men in a frontal assault directly towards the Copse of Trees. From this time on, for an hour and thirty minutes, the roaring of cannon and the bursting of shells from both sides was…one grand raging clash of ceaseless sound,—the most terrific cannonading of the war. The woods in front seemed lined with flame and smoke. Pandemonium broken loose was zephyr to a cyclone in comparison. Each man fell prostrate upon the level summit of the flat, low ridge. The site of Pickett’s Charge. At that moment, Gen. Hancock, rode up, almost trampling on men of the 19th Massachusetts in the mayhem. Devereux called out to him, “They have broken through! Shall I get in there?” To which Hancock replied, “Now, men, forward! Now’s your chance! Go at them!” The 19th Massachusetts and the 42nd New York together filled the gap, entering a pandemonium of hand-to-hand combat. Breaking through the first line of Confederates, the Massachusetts and New York men collided with the second line. Men in blue crushed in, five or six deep, some of them firing at any opportunity and possibly wounding as many comrades as Confederates. The colors of the 19th Massachusetts went down and were raised up again. And after terrible struggle, it was suddenly over. In the fight, the 19th Massachusetts captured four Confederate regimental flags which Devereux personally delivered to his brigade commander after the battle. Five men from the 19th Massachusetts were awarded the Medal of Honor for their role in repulsing Pickett’s Charge: Maj. Edward Rice for “conspicuous bravery on the countercharge against Pickett’s division where he fell severely wounded within the enemy’s lines;” Color Sgt. Benjamin F. Falls for the capture of an enemy flag; Sgt. Benjamin H. Jellison and Pvt. John H. Robinson for the capture of the flag of the 57th Virginia Infantry; and Corp. Joseph H. De Castro for the capture of the flag of the 19th Virginia Infantry. The 19th Massachusetts lost 9 killed, 60 wounded, 8 missing, a total of 77 or 35% casualties. Bradley M. Gottfried, Brigades of Gettysburg, (2003), p. 153. Waitt, p. 230; Gottfried, p. 153.